Five Things You Should Stop Feeding to Your Kids Right Now! We love our kids. We get down on our hands and knees and play with them. We kiss their boo-boos. We help them with their homework. We spend half our life driving them to extracurricular activities and playdates. We’d do ANYTHING to see to it that our kids are happy, healthy, and well-adjusted. So why do we feed them things that are implicated in causing everything from heart disease to cancer to learning disabilities? I don't know about you, but I've never seen a cylindrical turkey. I’m not saying it’s your fault. It’s not. If I had known 8 years ago what I know now, I would have completely changed the way I fed my daughter - from the day I learned I was pregnant with her. Problem is, I didn’t know. I didn’t know that the way I ate during my pregnancy partially shapes the way her body and brain will process foods for the rest of her life. If I had, I might have eaten a few more vegetables and little less ice cream, cake, pizza, and donuts. I didn’t know that sugar lights up the same reward centers in the brain as heroin and morphine, and I didn’t know that a child’s tiny brain is far more susceptible to getting hooked on sugar than an adult’s. If I had, I might not have taken so much glee in feeding her those first bites of sugary frosting on her first birthday. I didn’t know that the food dyes and additives allowed in this country are banned in many others because they are known to cause learning disorders, hyperactivity, and cancer. If I had, I might have read labels a little more carefully and tried to avoid processed foods a little more. I thought juice was healthy…and the grandmothers still do. I thought cereal was healthy…the boxes say so. I thought crackers, goldfish, and pretzels were healthy snacks…they are marketed as such. I thought the government and big food companies were trustworthy and had my child’s best interest at heart…the advertisements on TV told me they cared. I was wrong. And I just didn’t know. Fast forward to today. I know a lot more…maybe too much...definitely way too late. Because I inadvertently set some now deeply-ingrained eating patterns when she was in her formative years, it’s been a painful and slow process to make changes. But I promise that change is possible if YOU, the parent, are committed and patient. Just like extreme diets don’t work for adults, changing a child’s diet overnight won’t work and will likely create more problems than it solves. Start here and start now by removing the following 5 things from your child’s life and replacing them with healthier alternatives. An 8 oz bottle of 100% apple juice has more sugar than the same amount of Coke. Did you know that apple juice has more sugar than a Coke? It's nothing but straight sugar with a little vitamin C. You might as well put an IV in their arm or just give them teaspoons full of sugar. Yes, even 100% fruit juices are nothing but glorified SUGAR. If you want your kids to get nutrition from fruit, feed them whole fruit. Kombucha (a fizzy, low-sugar fermented drink)…. But mostly water. Teach your kids to drink water most of the time. Sodas, juices, and sports drinks are for special occasions. I allow my daughter to have juice or lemonade when we go out to eat or at birthday parties, but rarely at home. Juice does not count as a serving of fruit. If you want your kids to get more fruits and vegetables, feed them whole fruits and vegetables. 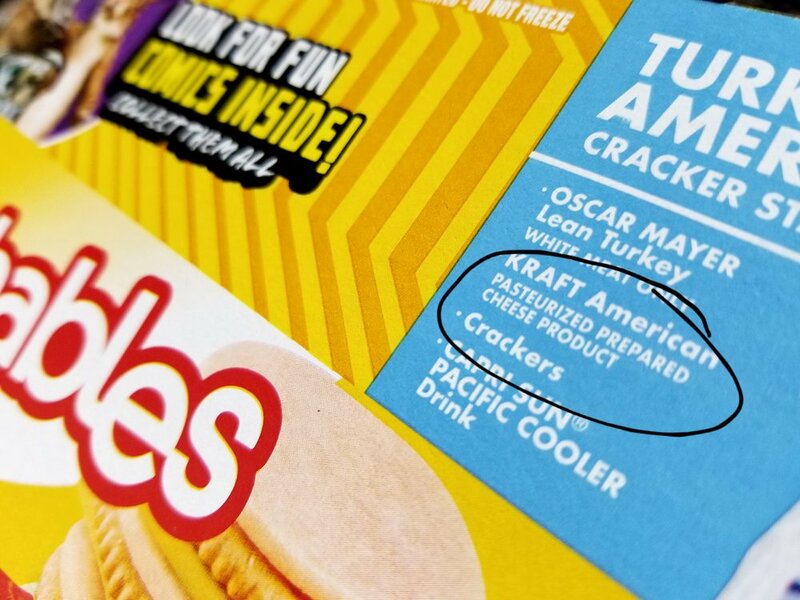 What the hell is "pasteurized prepared cheese product"? My husband calls them Junkables. And they, along with all other processed lunch meats, are horrible for your health. They are a mash-up of leftover pieces, parts, and cheapest cuts of meat from poorly-raised and sick animals. And they are laden with chemicals and preservatives. Processed meats cause cancer. Need I say more? Children need protein for healthy growth and development, but feeding them proteins filled with hormones, antibiotics and other chemicals isn’t a good thing for their developing brains and bodies. When you control the ingredients, you’ll have more control over your and your children’s health. Real Meat. If they’ll eat processed cold-cuts, they can learn to eat cold sliced chicken and turkey breast meat that you have pre-cooked on the grill or in the oven. This is as simple as grilling or baking a few extra pieces of chicken or turkey when you’re making dinner on Sunday night. Create your own “Lunchable” by packing up a few slices of the chilled “lunch meat” with real cheese (as opposed to the “processed cheese product” found in Lunchables) and a few whole wheat crackers. Beef, Venison, or Turkey Jerky. If you have dehydrator, you can make your own jerky. Get your kids involved with this. They’ll have fun choosing spices and seasonings to add to the jerky mix, and they’ll be far more open to trying and liking it! Hard boiled eggs. Eggs, especially from pastured hens, are an excellent source of protein and healthy fats, and are super portable! Yeah, I'm talking about you Yoplait Go-Gurt. Assuming a child isn’t lactose intolerant or otherwise sensitive to dairy, yogurt can be a good source of protein and calcium. But most of the yogurts marketed for children are FULL of sugar, dyes, and preservatives. A single Go-Gurt contains 1/3 of the recommended daily allowance of sugar for a child! Organic yogurt from grass fed cows. Luckily this one is fairly easy because, though they may not have the fancy kid-friendly packaging, the healthier yogurts still taste great! Try to find grass-fed and organic yogurts that contain less than 10 grams of sugar per container. My daughter’s favorite is Siggi’s Icelandic yogurt. Organic cottage cheese from grass fed cows. A bit harder to find, but becoming more widely available is Organic Valley’s full fat cottage cheese. Thumbs Down: Doritos, Fritos, and Cheetos (DFC’s). Nobody would argue that these processed food-like products are good for us and our kids. But do you know how bad they are? Check out the ingredients label and you’ll find things like MSG (yes, that’s monosodium glutamate, the stuff that’s been linked to obesity, migraines, and brain damage), partially hydrogenated oils (another cancer-causing fake food that also increases risk for heart disease), artificial colors (banned in other countries for causing cancer, asthma, and learning disorders), and up to four different kinds of sugar. These “foods” are completely devoid of any nutritional value, and worse are chemically engineered to make our kids want more and more and more. You are what you eat...so don't eat foods that are fast, easy, fake, or cheap. 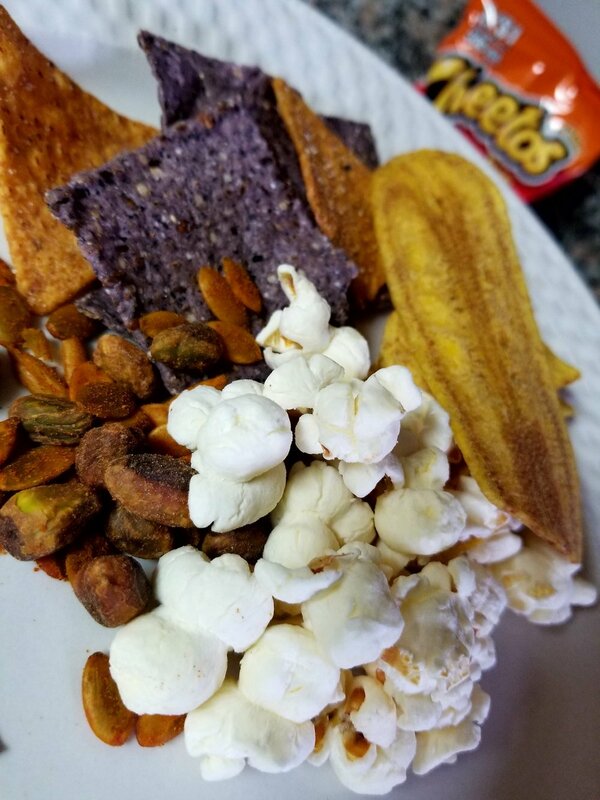 Real corn chips, bean chips, plantain chips, popcorn, and nuts and seeds are much better options that still give that salty crunch! Organic Corn Chips. Check the ingredients list. It should contain three things: organic ground corn, organic expeller pressed oil, and salt. Still not as healthy as eating carrot sticks…but a giant step up from eating the laundry list of ingredients found in DFC’s. Beanitos. I have fallen in love with these chips and my daughter (and even my hubby) loves them too! They are made from beans, expeller pressed oils, and salt and spices. What I love most about them is that they are high in filling fiber and protein! Organic popcorn. Once again, the fewer ingredients, the better. I look for brands that are organic and contain only organic/non-GMO corn, expeller pressed oil, and salt. When I can find it, my daughter looks forward to eating Buddha Bowl’s Himalayan Gold popcorn on family movie night! Salted almonds, cashews, or pistachios. They’re crunchy, salty, and loaded with healthy fats, protein and fiber. My daughter just started eating almonds in place of potato chips…and it just warms my heart. Thumbs Down: Uncrustables Peanut Butter and Jelly Sandwiches. I’m not telling you take away the good old PB&J sandwich. My daughter eats one every day for lunch. But are we really so lazy that we can’t make our kids a peanut butter and jelly sandwich? Here’s the problem with Uncrustables (and conventional peanut butters and jellies): like other processed foods, they are full of preservatives, dyes, sugar, and inflammatory oils. Homemade PB&J Sandwich. I’m not asking you to bake your own bread, but it takes 5 extra minutes to put together a healthier version of this kid standard. Better peanut butter. Your peanut butter should have two ingredients – peanuts and salt. If it has oils or sugar added, avoid it. Healthier Jellies and Jams. Go organic when choosing a fruit spread. Non-organic strawberries, grapes and other berries test high for pesticide residues, so choose organic when you can. Fruit spreads should contain less than five ingredients, and the first one on the list should be FRUIT. Ditch the Wonder bread in favor of a whole wheat bread. Better yet, choose an organic/non-GMO bread. We use Dave’s Killer White Bread Done Right or Eziekiel Ancient Grain Sprouted Breads. It took my daughter a bit to get used to these more “seedy” breads, but she did and now the healthier version of the PB&J is her “new normal”! BONUS Thumbs Down: Unhealthy Parents. Okay, so number six isn’t a food, but it’s perhaps the most important point of this post. If you want your kids to eat healthier, it has to start with YOU. Your children want healthy parents and they need role models to show them the way. Your children are completely dependent upon you to buy and prepare food for them. You control the shopping and food spending. You control what’s on the breakfast, lunch, and dinner menu. And if YOU are unhealthy, chances are pretty good your children are headed down the same path. This takes two things: a commitment to learning what constitutes a healthy human diet and then making the commitment to change your own health first. You don't need to be perfect. You don't need to force yourself or your kids to eat kale salads every day. You simply need to take stock of what you currently eat and make small swaps to make those things just a little more healthy! Something as simple as changing the kind of bread you use to make a sandwich or drinking an extra glass of water every day in place of a soda or juice can make a big difference over time! It's not a quick fix, but we all know that quick fixes don't work...and for kids, trying to push big changes will only create resistance. Be patient, make changes slowly, have an open mind, and set the example for your kids. This is the path to better health for both you and your family! What small changes do you think you can make to your diet today? I meet moms and dads every day that want nothing more than to help their kids be healthy. But they are not healthy themselves, and they don't know where to start. I'm offering a ground-breaking six month course that can help you get started. It's not a crazy diet. You won't make overwhelming changes to your current lifestyle. You won't get healthy or lose a bunch of weight in 21 days. You will learn how to make small swaps and sustainable changes to the foods you currently eat. You will learn how to effectively incorporate more movement and exercise into your life. You will learn how to reduce stress, get more sleep, and love yourself a little more. You will be happier and healthier at the end of six months and so will your kids. The course starts NEXT WEEK! Registration closes soon, so you need to sign up NOW! Click HERE for more information and reserve your spot!